This is one of those unique recipes that you have to try to believe it’s good. The ingredients are a very unique combination (in my opinion – I’ve never had anything like it before!) but the result is an incredibly savory, smokey grilled flavor. You can use this marinade on both chicken and turkey – I haven’t tried it on pork, but I think it would be delicious! I have also tried this on fresh corn on the cob…very good! 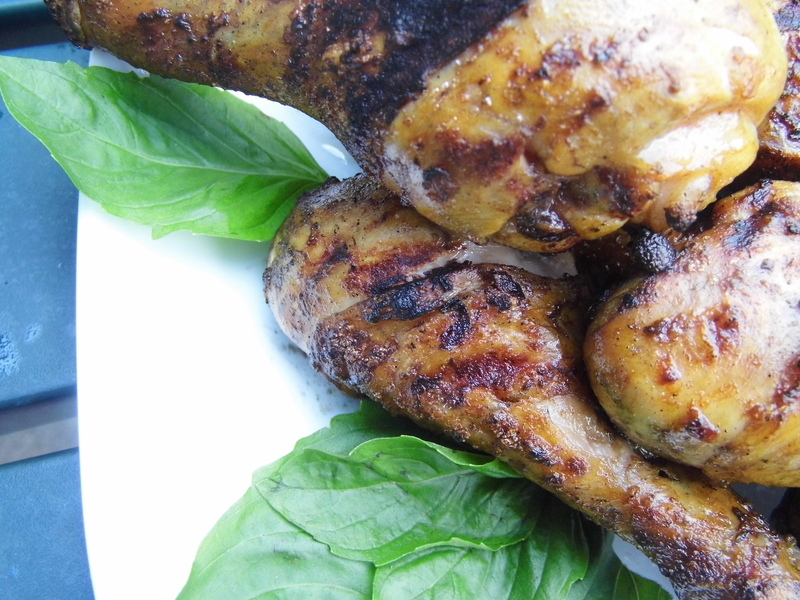 This recipe is a really nice change of pace from the more traditional BBQ chicken or Italian Dressing marinated chicken. My family requests it often – and I think yours will too! Combine all ingredients in a bow and mix well. Add desired meat to 1 cup of mixture and let marinate for 4 hours. Grill over medium heat for 20 minutes – turn and grill for 20 – 30 more minutes until juices run clear and meat is cooked through. Baste occasionally with extra marinade. The total cost for this recipe is $.55 – pretty good deal! I love that a few simple pantry ingredients combine to create an amazing meal! And the difference in cost between this recipe and a store-bought marinade is about $2.00. GREAT savings! What is your favorite way to marinate grilled foods? I’d love to hear from you! I quite agree! I have a soft spot for fried chicken! Complete with cole slaw, mashed potatoes, gravy and biscuits! I will have to try this recipe….I like it cus it doesn’t have hardly any sugar since I’m diabetic……but it looks and sounds great! thanks for the recipe! You can actually leave out the sugar if you want – it will still be good…I added it just to balance it out a little bit. I have a sweet curry marinade that I’ve been using for my chicken and it’s awesome! Let me know if you want to try it! I would love to try it! Thanks! here you go! http://hipfoodiemom.com/2012/06/03/grilled-curry-chicken/ I also made chicken curry puffs with this too. hope you try it! Sounds delicious. I think I’m going to do some grilled chicken tonight too….. It was so good! I’d love to hear what you think about the recipe! We had left over grilled chicken with pasta tonight, so that’s chicken 2 nights in a row. And your post still managed to make me crave it! We’ll try it after I give the family a mandatory 1 or 2 nights off from feathered-friends dinner! Glad to inspire! Looking forward to hearing what you think about it! I usually use lemon juice, olive oil, rosemary and thyme (I have huge rosemary and thyme plants on my deck), with a bit of salt and pepper. Looks delicious. After I finish cooking through different countries (when I get to Z) my next project is going to be cooking through the states. Maybe I’ll do this for Kentucky.